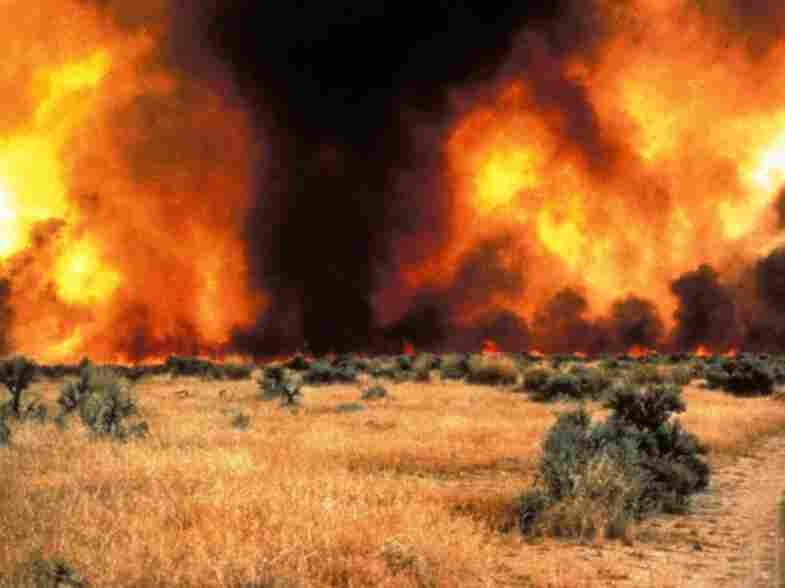 In Arid West, Cheatgrass Turns Fires Into Infernos Cheatgrass is about as Western as cowboy boots and sagebrush. And until recently, scientists didn't realize that the yellowish plant is making Western wildfires much worse. Cheatgrass is about as Western as cowboy boots and sagebrush. It grows in yellowish clumps, about knee high to a horse, and likes arid land. 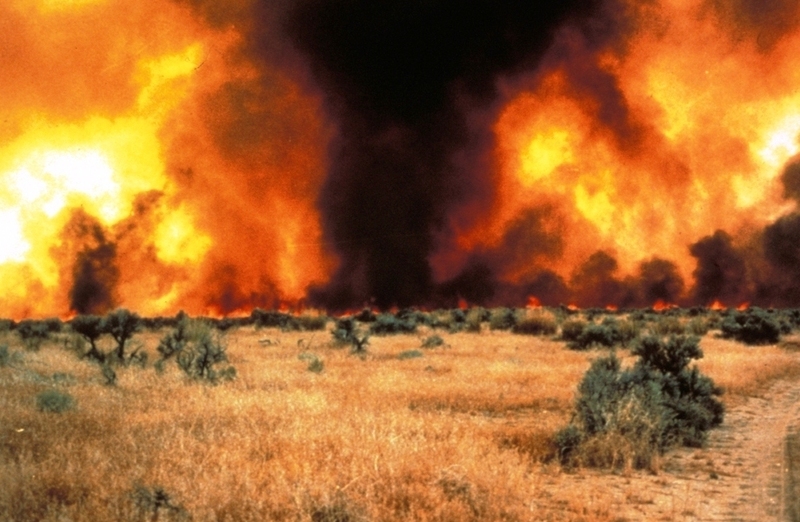 One thing cheatgrass does is burn — in fact, more easily than anyone realized. That's the conclusion from a new study that says cheatgrass is making Western wildfires worse. Jennifer Balch used to start fires in the southern Amazon to understand how they burn. Now she's turned her attention to the American West, where big wildfires are on the rise. Instead of lighting fires, though, she studies satellite photos of the Great Basin — that bowl of arid land stretching from California to Utah and Wyoming. It's cheatgrass central, and it burns a lot. But no one realized just how much until Balch started measuring those fires. "What we found was that cheatgrass actually doubles the likelihood of fire; that it burns twice as much as any other vegetation type — native vegetation type — in the Great Basin," she says. These cheatgrass fires are increasing partly because the climate is warmer and also because more people are living in cheatgrass country. More than half the fires Balch documented were started by people. And cheatgrass spreads because it's hardier than many native plants, especially in dry regions. Once it has moved in, cheatgrass becomes a fire hazard. The plant sets down roots early in spring and grows fast, filling in areas between native juniper or pinyon trees or sagebrush. When it dies in the summer, it becomes fuel. "So it creates, literally, a continuous carpet of fuels," Balch says. "So it's able to not only outcompete its neighbors but it literally is able to burn them out." 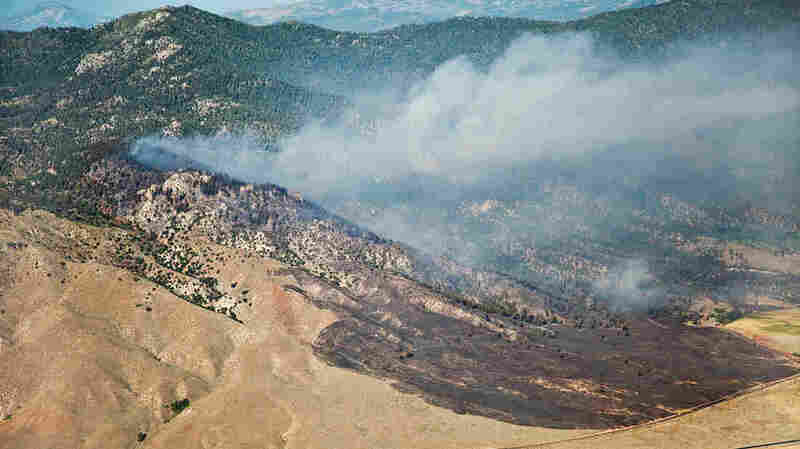 Between sagebrush, a continuous cover of cheatgrass fuels an intense fire in the Great Basin. Balch, who's now at Penn State University, discovered that of the 50 biggest fires in the Great Basin over the past decade, 39 of them involved cheatgrass. "They're more easily ignited, they spread faster, they tend to cover larger areas, and they occur more frequently. [It's] a huge management challenge," she says. That's a challenge for people like Matt Brooks, an ecologist with the U.S. Geological Survey who has spent years in the Great Basin. His opinion of cheatgrass: "In a word, I would probably say 'bad.' "
Brooks says Balch's research, which appears in the journal Global Change Biology, confirms what he's seen. "It's a disturbing thing to see because you end up losing the habitat for a wide range of species. And once it occurs, there's very little that restoration science can do to restore the previous conditions," Brooks says. There are some things that can be done, though, like planting green borders of less flammable vegetation around cheatgrass as a firebreak. And there's a fungus that kills cheatgrass — it's called the black fingers of death — but introducing it could be biologically risky to other plants. Jeanne Chambers of the U.S. Forest Service is another combatant in the war on cheatgrass. She says in Nevada, they're seeing fires burning as late as November and as early as January. "That really has never happened in the past. When we have dry conditions and we have cheatgrass in the understory, we have fuels that can allow those fires to burn almost any time of the year." And Chambers says a warming climate and an atmosphere with ever more carbon dioxide in it — essentially plant food — are just what cheatgrass likes.